Hi, Flash and Flex devs! We’ve been analyzing feedback from those of you who use IntelliJ IDEA for Flex and ActionScript development. A common problem turns out to be complicated project setup. To address this issue in IntelliJ IDEA 11.1, we have reworked the user interface, all the way from module wizard and project setup to run/debug configurations and AIR Packaging. We believe these changes will make product experience better for everyone, and especially for the users of Eclipse-based IDEs. Read on to see what we’ve changed so far. However, this isn’t final, as we count on more feedback from you to make additional improvements and polishing. Introducing a new fundamental concept: build configuration. 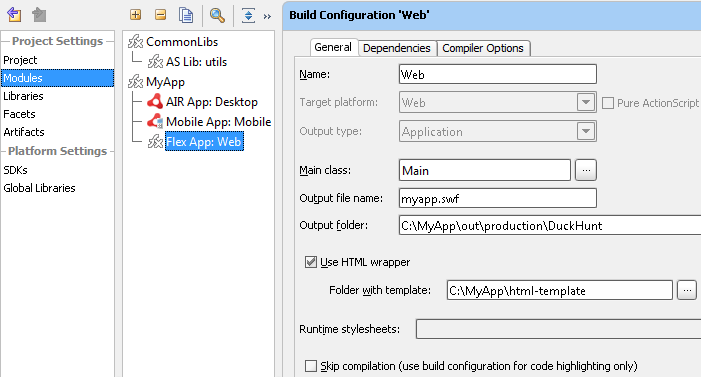 Build configuration is a set of parameters that define how to produce SWF or SWC, HTML wrapper, AIR descriptor and installer, Android and iOS package from the module source. ActionScript/Flex module can have one or more build configurations, thus allowing you to use the same code base to produce apps/libs for different target platforms (Web, Desktop or Mobile), pure AS3 or Flex based app/lib, use different SDKs, specific compiler options, etc. You no longer need to create different types of SDKs depending on your target platform. Now you just define the Flex SDK, and IntelliJ IDEA will automatically choose the correct subset of SWCs for each build configuration. The screenshot below shows a project with 2 modules: one of them (CommonLibs) produces a single pure ActionScript library, while the other (MyApp) has 3 Flex application build configurations: Mobile-, Desktop- and Web-targeted. Build configurations give you an easy start with a small test project, as well as all the power to set up a huge multi-module enterprise level project with complex dependencies and various compiler options. Hint: You can switch build configurations very quickly if you assign a keyboard shortcut to the action. IntelliJ IDEA 11.1 will open your Flex project and convert it to the new settings on the fly (having backed up previous settings), so it’s easy to start using new features in no time! If you find anything unclear or inconvenient, please leave your comments here, or reach us on the forum or the issue tracker. Let me remind you that we also provide Flash profiler and Flex UI designer plugins (we’ll post demos on the latter shortly). This entry was posted in New Features and tagged ActionScript, AIR, Flash, Flex, Flexmojos, FlexUnit, Nika. Bookmark the permalink. We use the Flex support as part of an ActionScript-only Video player that we include in a Grails project. To do so, we include the Flex Aspect on the Grails Plugin project that contains it. Unfortunately, in 11.1, it doesn’t seem that this setup is possible anymore. Do we need to separat out the code into two trees? Or could we come up with some sort of clever exclude with a separate source root for the Flex support? At the first glance I would suggest having separate modules for Groovy and ActionScript. This would also keep the code more separate and clear. Would this work for you? @D This is the regression in the latest build, sorry for that! We plan to publish the fixed one today. Where do you set up the remote server (data) configuration? I see it in the compiler settings, but it’s greyed out and cannot be edited. Where do you go to point the application to the services-config.xml file on a ColdFusion server? Also, I tried to use the Flash UI designer plugin with this version, but the “Switch to Design View” button is always greyed out and cannot be selected. @Mike McConnell See legend at Compiler Options tab. Grey text doesn’t mean that option is not editable. Just click to the right from the option name. Design View works only for Flex 4, make sure that you have http://ns.adobe.com/mxml/2009 language namespace. Thank you, Alexander. Your recommendations worked perfectly for both the compiler settings and the Design view. Not real sure what good design view is, though, except for previewing component layouts and properties. It’s not the same “design view” I’m accustomed to. And just one other point: it’s not real intuitive that you have to click in an undefined area to the right of the compiler config settings to bring up a text entry box. I think it might be better to put empty text boxes there to let developers know that they can input something into the text field. Or perhaps just a button with some elipses to clue users in on the fact that they can search for the services-config.xml file for that particular server setting. I was expecting the flash UI designer to allow me to drag and drop, however it seems to have extremely limited functionality. Is the intention to upgrade/update this in the future, or am I just doing it wrong? @Rob yes we will do that eventually. Feel free to submit a feature request at http://youtrack.jetbrains.net/issues/IDEA#newissue=yes so others can vote for it thus raising the priority. Absolute joy! IntelliJ IDEA is way better than rest. I hope that you guys come up with a better GUI Designer than FlashBuilder’s Design View. Does Intellij support building AIR Desktop using native installer option? Having some difficulties with the new flex module build configurations. Previously I had 2 modules A and B, B depended on A (used classes defined in A and locale resource bundles defined in A), so I would simple have module B define a module dependency on A. This doesn’t seem possible in the new interface. I have set up a file dependency for B to use the source code of A, this fixes everything except that B still cannot resolve the resource bundles defined in A. I have tried many combinations of dependencies, adding shared libraries etc. Could someone tell me how to get the old module dependency style working in this new UI? Or how to resolve the shared locale resource bundles between flex modules? The multiple build configuration seems like a great idea for deploying the same module code for web, mobile etc, but at the moment I’m stuck with a broken build configuration! You need to make build configuration in module B dependent on build configuration in module A (given that A-build configuration is a library). Click ‘+’ button to the right (or to the bottom) of your dependencies list and choose ‘Build configuration’. If your A-build configuration is not a library for some reason (it should be converted automatically if you your project was configured using IntelliJ IDEA 11 or 10.5), you can make it a library by clicking on ‘Change’ link at General tab. Thank you, that seems to work, actually modules A and B are both apps, but I added another build configuration for Module A as a library which seems to work. I now just have a problem with Module B not being able to resolve some assets. Module B has classes which have embedded assets which actually come from Module A. I have tried including the assets directory in the Compiler Options Items to include in output SWC for Module A and also tried adding the files to the dependency of Module B, but Module B fails to compile saying it cannot resolve the assets for transcoding. If you have any suggestions to fix this, that would be great. In the mean time I will just have to copy the asset files over to Module B to get it to compile. @Chris it is possible to configure project without copying assets. 2. Make sure that paths to assets in app source do not contain leading slash (if assets are in the same module – leading slash is required, but if assets come from SWC – usually not). This must be a relative path from source folder of lib module to the asset itself. Thanks Alexander, it is now working. Unfortunately it breaks our build, since we are using ant and a different build config to IDEA, what worked before doesn’t in the new update. I guess we should be changing our ant build to work the way IDEA does the compilation, but for now I will do as you suggested and make sure I don’t commit my build breaking changes. In IDEA 11.0 there was fcsh, Flex compiler which is using incremental compilation, and from my experience the fastest way to compile even a big project. Why is it absent in 11.1? Or how can I add it to 11.1? I’m having a problem debugging a pure Actionscript App on Android. My build configuration successfully creates the .apk file, and if I manually install it on the Android device it works ok. But when I setup a run/debug configuration, (with run on Android device and debug over USB), I always get the following error: “No Devices Detected”. Then I try to debug from Intellij IDEA and get the error. It looks like the device got disconnected somehow in the process. Switching back to Eclipse. You’ve broken my projects for the last time. Backwards compatibility would have been nice. @Mike sad to hear, and we’re really sorry for breaking up your projects. Could you please some details on what is broken so we can fix it in the next builds? Thanks! Messed up my 11.0 project as well. imports for fl.controls.Button no longer work. Pretty stuck now. @Mike Hogan To get fl. * classes available go to Dependencies tab of the related Flash build configuration (under Flash module node in Project Structure dialog) and add required SWCs from Flash Pro installation. Is it still possible to create a run/debug configuration where nothing gets launched? It is often useful to simply refresh a browser window instead of always opening a new one. @Scott There’s Flash Remote Debug run configuration. It doesn’t have ‘Make before launch step’, but Ctrl+F9 makes everything if needed. @Alexander–now that I see that default configuration, it all makes sense. Up and running again. Thanks! Im a newbie to IntelliJ and I just downloaded version 11.1 for linux but I don’t have the option to create an ActionScript module. If anyone could tell me what’s missing I will appreciate that. Thanks! @Pablo First please ensure that you have Flex plugin enabled (Settings -> Plugins). 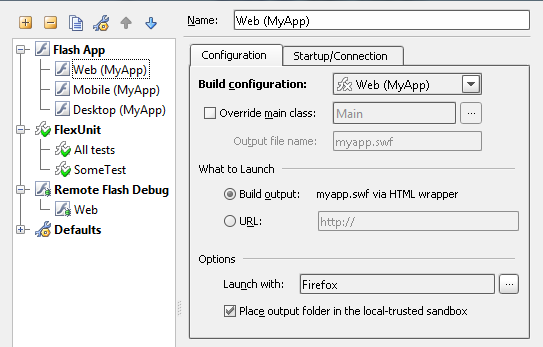 Then click File -> New Project -> Create project from Scratch and select Flash module type. In IntelliJ 11.0 we were able to set a Project SDK and then have our Flex modules inherit that SDK. That functionality no longer appears to be supported in 11.1 – or am I missing something? When I set a build configuration the dropdown no longer shows a “Project SDK” and setting it to “No SDK” truly assigns it no SDK so there is no source highlighting, etc. @hayesmaker This blog post is exactly about IntelliJ IDEA 11.1.x. Now you configure SDK of ‘Flex’ type regardless of what kind of application or library you are going to develop, because Flex SDK includes AIR SDK. When configuring Flash Build Configuration you can choose any target platform: Web, Desktop or Mobile and required SWCs from Flex SDK will be picked automatically.